Selling your home can be easy if you have the right professionals to help you. 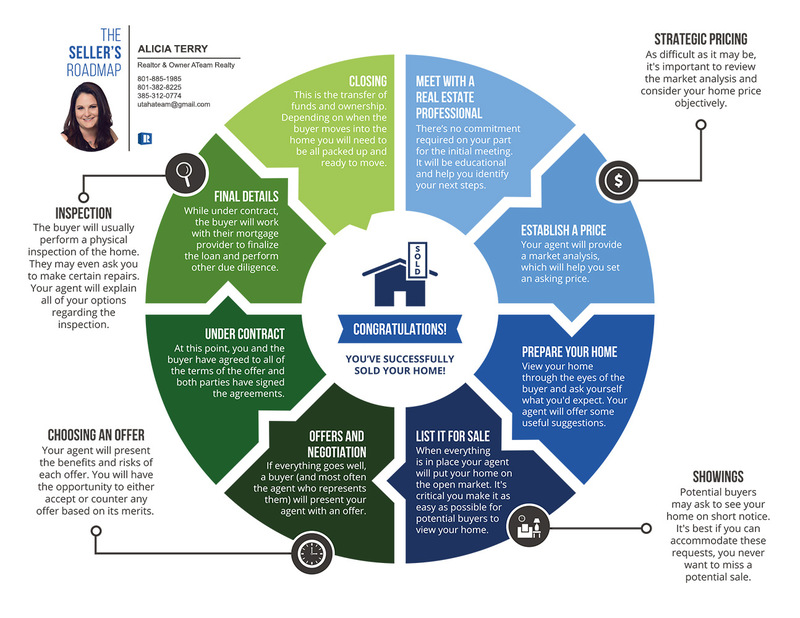 What are the steps and things you need to know when your thinking of selling your home. ATeam Realty is a team of local real estate experts ready to reveal the secrets of how we can help you sell your home. From setting the price to creating marketing campaigns for traditional media and Web, we’ve got a proven plan that will match your home with the right buyers for the right price. We are committed to fast, professional and courteous personal service to help you understand and feel at ease throughout the home selling process. Our trained and certified agents specialize in the Utah real estate market and are prepared to sell your home to the right buyer for the best price. like you did your job. You get a good review when you have met all the clients needs and standards. What is your motivation to sell? Why are you moving ? This determines, timing, pricing, and strategy. In a declining market, these are the most important questions you can ask yourself. home. Anyone can tell you they can sell your home for the price you want. A good agent will be honest with you upfront and tell you not what you want to hear necessarily but the truth. That gives you the power to make a correct decision to sell or not to sell. Otherwise you put your home on the market do showing after showng. You have to keep your house clean and prepared for months to then find out that it won’t sell for that price. A home has to meet appraisal for most buyers to purchase it. Meaning a good agent pulls comparable’s for you so they can justify your price to an appraiser. 1.Sign listing documents with your agent. Any good agent will let you out of a contract if they are not fulfilling your requirementts. Make sure they will. 2.Seller disclosures – (7 days): I send these to the other agent for the buyer to review. 3.Due diligence – (14 days): The buyer will schedule an inspector to come to your home. This is typically a 3-4 hour block of time. It is common for buyers to ask for seller repairs to be made in an addendum. In my experience, it is best to help the buyer’s agent understand how asking for these will delay the deal and could muddy the loan. Once it is in the contract the underwriter will want proof it has been completed. This can take weeks and is usually not worth the headache. 4.Appraisal/Financing – (25 days): Most deals are dependent on a loan and this may trigger all sorts of issues. From needing more time, to the underwriter needing more bank documents to go forward with the loan. It is common to see an addendum to the contract at this point. 5.Settlement – (30 days): One day prior to closing, I will receive a copy of the HUD’s for review and to catch any errors. Closing – The next day you will sign documents and HUD’s at the Title company. This takes about 1 hour. The title company will explain and answer any questions you may have. I will be present at the closing. Funding– Once the documents are signed, the loan will be funded. This can take anywhere from a few hours to a few days. KEYS– Once the loan is funded the buyer receives the keys to your home!!! How to stage your home or what things you can do to make it stand out from the others! Before you open up your home to show it to a potential buyer, you’ll want to make sure your home looks amazing! In order to achieve great staging results, you’ll want to start by looking at your house through a buyer’s eyes. Walk through your home as though you’ve never seen it before. This kind of reflection will help you see what needs to be done. The right home staging tips will help highlight your home’s strengths, downplay its weaknesses and appeal to the greatest possible pool of prospective buyers. One of the benefits of working with ATeam is our strong understanding of how to help you achieve excellent staging results. When selling your home with ATeam, our team will meticulously walk through your home in order to help ensure your home shows with its best foot forward. Below are just a few things you can expect when ATeam visits with you to discuss staging. Tip 1– Appearance is everything. Fortunately, homeowners can take matters into their own hands with great ease and low cost. Our team understands what buyers want and will help coach you so that you know how to make your look home model ready. Tip 2 -Begin by packing away personal items. This is one of the simplest and cheapest things you can do to sell your house or condo quickly. De-personalizing e your home will help buyers view it as their potential home with greater ease. Removing items from counter tops in the kitchen and bathrooms. If you have kids, get rid of the toys throughout the entire house.Put things in boxes and neatly stack them in the corner of the garage. Anything extra should go in a small, rented storage unit. Even better, ask a friend or relative to hang onto your items for free. Pack up 90 percent of your home if possible with a minimum 50%. If your home has been painted recently, consider yourself ahead of the game. If not, take a paintbrush to the rooms that need it most. Sellers who paint the interior of their home will see a large return on their investment. Fresh, neutral paint on the walls, trim and doors is worth its weight in gold — it makes everything appear clean and new. That bathroom vanity that is old and outdated PAINT IT. Those outdated kitchen cabinets PAINT THEM. You can look up the most popular trends and paint them. You will wonder why you haven’t done it before this. Tip 5– Rearrange the rooms in your home to feel open and spacious to prospective buyers. Make sure each room has a distinct, useful purpose. Closets should be neat and organized. The pair of shoes that you haven’t worn in 10 years, get rid of them. Tip 6 – No one wants to look at a dirty, smelly home especially not prospective buyers. So make sure your house or condo shines from top to bottom. Cleaning and deodorizing a home before every showing should be first and foremost. The goal is to help buyers imagine themselves living in the home. When buyers see an unkempt home or smell something when they first walk in, they become turned off immediately. They can rarely see past it to look at all of the great features in the home. We suggest having the house professionally cleaned so that everything is spotless — windows, sliding glass door tracks, garage, basement, ceiling fans, etc. We also recommends baking cookies in the oven, bringing cinnamon sticks to a slow boil in a pot of water or using air freshener to mask smells before each showing. Ridding the home of litter boxes is also a must. Tip 7 – Whatever you do, don’t overlook the home’s exterior when selling. Curb appeal is just as important as cleaning the inside of the home — it’s the buyer’s first impression of your home. You only get one chance to make a first impression. With a limited about of buyers out there — you want your home to stand out. Mow the lawn. Make sure the sidewalk and driveway are free of clutter and debris and ensure the house number is easily visible. It may also be beneficial to pressure-clean the exterior of your home, driveway and sidewalk, if needed. Another valuable low-cost solution? Mulch. Mulch is cheap and covers a multitude of sins. It makes everything look trim and neat. For even more information Contact us today to receive a complimentary copy of our “47 Tips for Sellers” or to schedule some time with an ATeam Listing Specialist.